As part of a wider programme focusing on tea, we were tasked with producing a set of ‘Special Edition’ teas to elevate Bewley’s tea credentials and to capitalise on the growth being experienced in loose-leaf tea. It was important that the pack design not only motivated consumers to buy the product but also helped share the Bewley’s story and deliver on their mission ‘To Delight the Senses’. Focusing on three of the best-selling variants, Darjeeling, Assam and Irish Breakfast Tea, the special edition teas needed to work both individually and as a set. The design also needed to take into account that the chests would be displayed in multiple locations – in cafes and restaurants to add theatre and interest as well as being able to hold their own and compete for attention on a retail shelf. 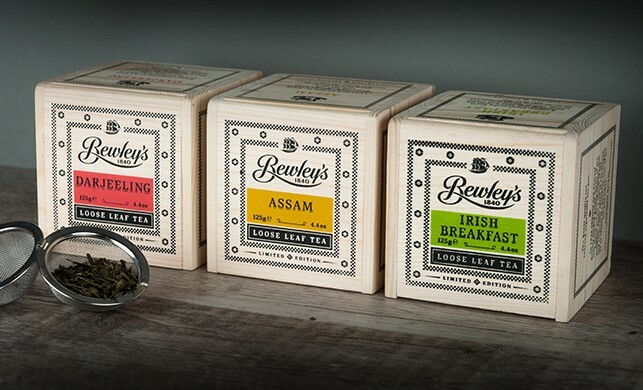 We recognised the opportunity to create a unique format for Bewley’s Special Edition teas that would build on the brand’s compelling history as the original independent tea importer to Ireland. In 1835, Samuel Bewley imported 2,099 chests of tea directly from China on the Hellas ship and in doing so, broke the East India Company’s monopoly. This story became the inspiration for the packaging. We used small wooden chests as a nod to the original format that the tea would have arrived in. The ship became the symbol of the Bewley’s spirit, taking pride of place at the top of the packs. The panel design uses elements such as the mosaic tiles from the Grafton Street cafe, creating a unique and ownable frame that is both attractive and functional. Colour was intentionally kept to a minimum in order to mimic the look and feel of the original stencilled chests; black being the predominant colour with a pop of brighter colour to differentiate between the variants.